You've never seen anything like them in your LIFE! Amazing, Vibrant, and Extraordinary, these Rainbow Roses are an amazing gift that will blow them away on their special day. All the hues of the rainbow come to life in this one of a kind bouquet. Made with a special process that enhances color in each petal, these roses are turned into a magical piece of art that they won't soon forget. Rainbow Roses: 1 DOZEN You've never seen anything like them in your LIFE! 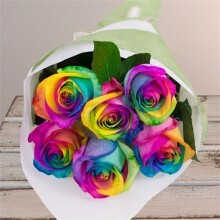 Amazing, Vibrant, and Extraordinary, these Rainbow Roses are an amazing gift that will blow them away on their special day. All the hues of the rainbow come to life in this one of a kind bouquet. Made with a special process that enhances color in each petal, these roses are turned into a magical piece of art that they won't soon forget. LEAD TIME: 5 days to 1 week IMPORTED FLOWERS FROM HOLLAND & ECUADOR! 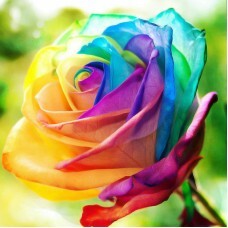 Rainbow Rose 1 pc You've never seen anything like them in your LIFE! 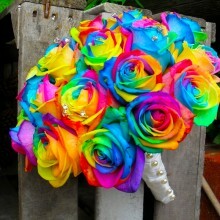 Amazing, Vibrant, and Extraordinary, these Rainbow Roses are an amazing gift that will blow them away on their special day. All the hues of the rainbow come to life in this one of a kind bouquet. Made with a special process that enhances color in each petal, these roses are turned into a magical piece of art that they won't soon forget. LEAD TIME: 5 days to 1 week IMPORTED FLOWERS FROM HOLLAND & ECUADOR! 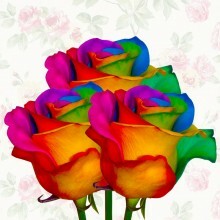 Rainbow Roses 3pcs You've never seen anything like them in your LIFE! Amazing, Vibrant, and Extraordinary, these Rainbow Roses are an amazing gift that will blow them away on their special day. All the hues of the rainbow come to life in this one of a kind bouquet. Made with a special process that enhances color in each petal, these roses are turned into a magical piece of art that they won't soon forget. LEAD TIME: 5 days to 1 week IMPORTED FLOWERS FROM HOLLAND & ECUADOR! Rainbow Rose 6pcs You've never seen anything like them in your LIFE! Amazing, Vibrant, and Extraordinary, these Rainbow Roses are an amazing gift that will blow them away on their special day. All the hues of the rainbow come to life in this one of a kind bouquet. Made with a special process that enhances color in each petal, these roses are turned into a magical piece of art that they won't soon forget. LEAD TIME: 5 days to 1 week IMPORTED FLOWERS FROM HOLLAND & ECUADOR!